How To Leash Train a Puppy The Easy Way – ComeHereBoy! This post is called “How to Leash Train a Puppy the Easy Way” but I kind of feel like it should be called “Leash Train Your Puppy Now so Life is Way Easier Later”. That’s kind of long and clunky though, so I went with the other one. As with all things puppy, if you can leash train a puppy while he is young and learns easy and doesn’t have any bad habits, things will be way easier later. Rather than spending your time training a large, excited dog not to drag you across the street (which he has already discovered may be more rewarding than treats), you can take your tiny puppy that only knows how to bound around and teach him that walking next to you is really fun and rewarding. As your puppy is small and doesn’t understand how the world works for the most part, I especially think trying to leash train a puppy with choke collars or popping the leash is cruel. Your puppy might very well become concerned about walks or the things it sees on walks as they can associate the uncomfortable feeling of the choke chain or pop with the things around him, rather than what he is doing wrong. I have personally not found popping the collar to be a very effective way of leash training puppies (before I really turned to positive training,) especially because they have such short attention spans. You have to constantly pop and then it’s like it never happened. With food/praise/toys though, puppies are usually more than eager to pay attention to what gets them more of that delicious stuff. Remember to be consistent when you leash train your puppy. If you’re going to let the kids and spouse walk the puppy, they all need to be prepared to expect the same things of the puppy as you are. Your puppy will leash train far more quickly if everyone practices with him. There are several different techniques that can be used to leash train a puppy, but today we’ll be focusing on the one I consider to be the quickest way. So, the way I do this (and it may be a bit hard to juggle at first, but you’ll get the hang of it) is to put the handle of the leash over your left wrist and wrap the leash up/ball it up in the same hand, then hold the clicker on top of the ball of leash with your thumb on it. Give the puppy a good amount of slack – enough that he can kind of get ahead of you, but not so much that he can easily wrap himself around your legs. Now, just stand there as your puppy bounces around. Any time you feel the leash slack, click (with left hand) and treat (with right hand.) Do this for a bit until your puppy gets the idea and is not hitting the end of the leash as much. At this point, you can start walking. Whenever the leash is loose click and treat. Make sure you stand back up straight in between clicks and treats so the puppy isn’t just nibbling on your hand the whole time you’re walking. Don’t reward jumping or any other undesirable behaviors. If the puppy pulls toward something specific like a squirrel or a tree, just stop and freeze until the puppy realizes that when he pulls, he doesn’t get to move. He will then generally sit or back up in frustration and you can click and treat for a loose leash as you begin moving forward again. Now, keep the initial leash training sessions short and fun, no more than 5-10 minutes. This may feel slow at first, but if you’re doing this with a young puppy, they don’t need the walking exercise so much yet, so just make sure they get exercise in other ways until they can walk consistently on a loose leash. It’s really worth it to take the time to build good walking habits so that you don’t have to break bad ones later because of impatience. 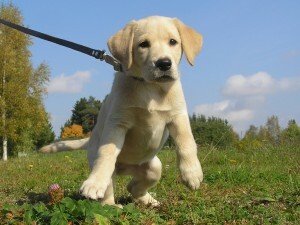 In my opinion, loose leash walking is one of the most useful behaviors a puppy or dog can have. Let me know how leash training your puppy goes or if you have any questions about this method!